Born: January 3, 106 B.C.E. Died: December 7, 43 B.C.E. Marcus Tullius Cicero was born on January 3, 106 B.C.E. , at Arpinum near Rome, the oldest son of a wealthy landowner, also named Marcus Tullius Cicero. At a young age Cicero began studying the writings in his father's library. Both Cicero and his brother Quintus became greatly interested in philosophy and public speaking. When his father noticed this interest, he decided to take his sons to Rome for the best education that could be found. Rome was also a place where the boys could increase their social standing. wars that followed. Cicero's first appearances in court were made during the dictatorship (a form of government where one person rules with absolute power) of Sulla (81–80 B.C.E. ). In one case, while defending Sextus Roscius of Ameria on a false charge of murder, he boldly made some outspoken comments on certain aspects of Sulla's regime. It would not be the last time Cicero spoke out about those of higher power. In 79 B.C.E. Cicero left Rome to study in Rhodes. By 76 B.C.E. he was back in Rome, where he married Terentia, whose family was wealthy and perhaps part of the ruling class. In 75 B.C.E. he held the office of quaestor, which brought him membership in the Senate, the highest council in the Roman empire. In 70 B.C.E. he achieved his first great success, when he prosecuted Caius Verres for extreme mismanagement of government in Sicily. In 69 B.C.E. Cicero held the office of aedile (public works and games) and that of praetor (judge). In 66 B.C.E. , Cicero made his first major political speech in support of the extension of General Pompey's (106–48 B.C.E. ) command in the Mediterranean. During the following years he acted as a self-appointed defender of that general's interests. In 63 B.C.E. Cicero became consul, or an official representing the government in a foreign land. He had reached the highest political office at the earliest legal age, a remarkable achievement for a complete outsider. In the years after his consulship, Cicero watched Caesar (100–44 B.C.E. ), Pompey (106–48 B.C.E. ), and Crassus (140–91 B.C.E. ) form the First Triumvirate, a powerful allegiance within the Senate. 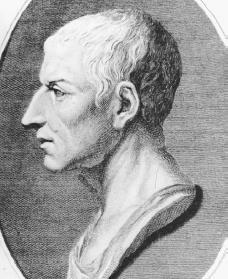 Cicero refused offers to become a fourth member of this alliance, and he publicly expressed dislike for the violent methods Caesar used in his consulship. This led to Cicero's exile, or forced removal, to Macedonia. He lived there for sixteen months, until the efforts of his friends secured his recall in August 57 B.C.E. During the next eight months Cicero tried to separate Pompey from his partners. Early in the summer of 56 B.C.E. Pompey ordered Cicero to stop his efforts. For the next four years he was largely out of politics, devoting himself to writing and occasionally emerging to make public appearances. After Pompey's death Cicero took no part in politics and devoted himself to writing works on philosophy and other matters. Apart from his increasing dislike of Caesar's absolute rule, Cicero's life was made unhappy during these years by domestic sorrows. In the winter of 47–46 B.C.E. he divorced Terentia after thirty years of marriage. The following summer he was deeply grieved by the death of his much-loved daughter Tullia. Cicero was not involved in the conspiracy against Caesar, though he strongly approved of it. After Caesar's assassination, he took a major part in establishing a compromise between Mark Antony (c. 81–30 B.C.E. ) and those who killed Caesar. Before long he concluded that Antony was as great a threat to liberty as Caesar had been. But Octavian (63 B.C.E. –14 C. E.), having seized power in Rome by force, reached an agreement with Antony and Lepidus (died 152 B.C.E. ) to set themselves up as a three-man dictatorship. They started by outlawing many of their enemies, and among the first names on the list was Cicero's. He could have perhaps escaped, but his efforts were half-hearted. In December 43 B.C.E. he met his death at the hands of Antony's men with courage and dignity. As a politician Cicero was ultimately unsuccessful, since he was not able to prevent the overthrow of the republican system of government. It is in his speeches and his writings that Cicero's legacy truly lies. The texts of fifty-seven speeches have survived and Cicero delivered at least fifty more, nearly all of which were published but have since been lost. The collection of the existing speeches is impressive both for its bulk and its quality. Of the legal speeches, "Pro Cluentio" (66 B.C.E. ) is the longest and most complicated, but it gives a vivid picture of life in a small Italian town. The much shorter "Pro Archia" (62 B.C.E. ) is notable for its sincere and persuasive defense of a life devoted to literary pursuits. Of the political speeches the "Catilinarians" are the most famous. The fourteen "Philippics" are probably the finest, however, because in them Cicero concentrated all of his energy and skill with a directness that he did not always achieve. Nearly all of Cicero's works on philosophy, politics, or rhetoric (the study of speaking) are in dialogue form. They were written in an elegant Latin language of which Cicero was such a master. Several are devoted to ethics, religion, and other philosophical subjects. They are extremely valuable because in them he reproduced the theories of many of the leading Greek philosophers of the post-Aristotelian schools, such as the Stoics and the Epicureans, whose own works did not survive. Another group of Cicero's work is concerned with political theory, especially "De republica" (54–51 B.C.E. ), of which barely one-third survives, and "De legibus," started in 52 B.C.E. but perhaps never completed. These works were also to some extent based on Greek ideas. But the basis was reinforced by the Roman genius for the art of government and Cicero's own considerable experience of politics. The collection of Cicero's letters is undoubtedly the most interesting and valuable part of all his enormous literary output. It includes nearly eight hundred letters written by him, and nearly another one hundred written to him by a wide variety of correspondents. The surviving letters belonged mainly to his last years. There are only twelve dating before his consulship, while more than a quarter of the collection was written in the last eighteen months of his life. Some of the letters were as carefully composed as the speeches or dialogues. Most of them, especially those to his brother or to close friends like Atticus, have an originality that is often lacking in his more calculated work. In these intimate letters Cicero used a very informal style, with frequent use of slang and words or phrases in Greek. The letters cover an immense range of topics, but above all, they give an incredibly vivid picture of Cicero himself. The letters demonstrate his energy and industry, his courage, his loyalty, and his basic honesty, kindliness, and humanity. Thanks to his letters, we know Cicero as we know no other Roman. Everett, Anthony. Cicero: The Life and Times of Rome's Greatest Politician. New York: Random House, 2002. Forsyth, Fiona. Cicero: Defender of the Republic. New York: Rosen Central, 2002.